The Massachusetts’ School Metrics and Research Tool (MA SMART) is a database of geographical, environmental, social, academic and facilities information for every school in Massachusetts. These data are used to uncover new relationships between environmental/social stressors and student health, thinking and performance. MA SMART is an ongoing research program designed to investigate how school buildings influence the health and performance of students. In our first analysis, we compared contextual variables – surrounding greenness and ambient air pollution – to chronic absenteeism rates, defined as the percent of students that missed 10% or more of the school days in an academic year. In the paper, titled The Impact of Particulate Matter Exposure and Surrounding “Greenness” on Chronic Absenteeism in Massachusetts’ Public Schools, absenteeism rates were obtained from the Massachusetts Department of Education. For each school, satellite imaging was used to determine fine particulate matter (PM) concentrations and normalized difference vegetation index (NDVI), an indicator of how green the landscape is within a 250 meter buffer of the school. Schools with higher NDVI scores, or more surrounding greenness, were found to have lower absenteeism rates. A similar trend was found with PM concentrations: a 1 μg/m3 increase in PM was associated with a 1.58% increase in chronic absenteeism rates even though nearly all schools were below the National Ambient Air Quality Standard of 12 μg/m3. These relationships were found after controlling for other factors that may influence absenteeism rates such as race and household income; in fact, the effects of the contextual factors were roughly the same size as these well known predictors of school attendance. 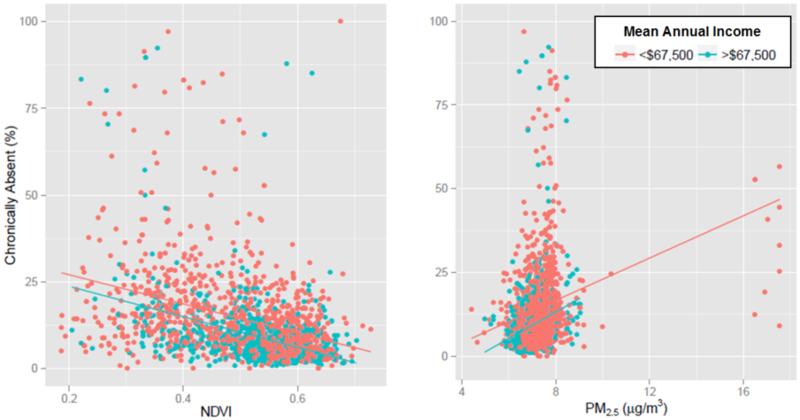 Particulate matter and surrounding greenness were both found to significantly impact chronic absenteeism rates, regardless of whether the school was in a high-income bracket county or low-income bracket county. A large number of students in Massachusetts’ public schools may be impacted by these contextual factors. Based on these associations, a school at the 75th percentile for NDVI is expected to have 2.6% lower chronic absenteeism rates than a school at the 25th percentile. This 2.6% corresponds to 25,837 fewer students being chronically absent in Massachusetts’ public schools. Similarly, if PM concentrations were reduced by 1 μg/m3 across the state, 15,852 fewer students would be chronically absent each year. Existing schools have little control over their surrounding context, but there are several ways to address extramural issues with intramural solutions. In the case of air pollution, schools can improve ventilation systems. For example, improved filtration of outdoor air entering school facilities or standalone filtration units can reduce PM concentrations indoors. Improvements to the building envelope can also reduce or eliminate particle intrusion. Schools in urban areas can counteract the effect of low levels of surrounding greenness by investing in landscaping, improving access to parks and nature, and providing curricula that immerse students in nature.